This extra virgin olive oil from Tuscany is cold pressed and left unfiltered to maximize the delicate flavor of ripe olives. The oil comes from three different varieties of olive plants: Leccino, Frantoio, and Pendolino. A great gift for any wine lover. 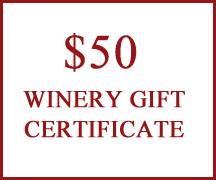 Our gift certificates are redeemable for any in-person visit at the winery on any purchase. 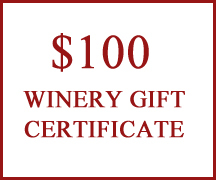 Whether it's wine, tastings, events or food at the Vineyard Grille, send gift certificates are great for any winery experience.